Here I am using the default site name for apache, but you may have already yours, in that case just change to the correct and replace /etc/apache2/sites-available/default by the correct one. Of course you have to change path to your AuthUserFile and replace with the correct path. if file do not exist yet you can create it for example under /etc/apache2/secure_dir. This step is mandatory if you don’t want user to be asked for password if they have already a client certificate. The line display have to be added into your AuthUserFile, just copy/paste the line as there are in the file using vi. And click Ok and next… You will have the confirmation that the new autority certicicate is installed. Now you have to install your client certificate : clic on client.p12 and follow the insctruction (keep all default selections), if you fallowed the step 2 correctly there is no need for password. That all, if you complete all these steps you have a secure ssl SHA2 autentified connection from your brother (anywhare in the world) to your apache server. I hope you will enjoy this tutorial, put a coment if you have question/ issue , i will try to help as mush as I can. Ps: this mzthod is working well with chrome and internet explorer. 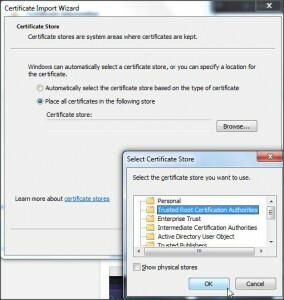 To install the cert on firefox there is a diifferent method, I will try to provide it later..